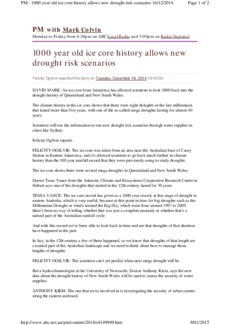 An ice core from Antarctica has allowed scientists to look 1000 back into the drought history of Queensland and New South Wales. The climate history in the ice core shows that there were eight droughts in the last millennium that lasted more than five years, with one of the so-called mega droughts lasting for almost 40 years. Scientists will use the information to run new drought risk scenarios through water supplies in cities like Sydney. Felicity Ogilvie reports.